This lecture provides an introduction to databases and their use with the Java language. Can use grep / awk to find stuff and can easily read from shell. But, is hard to pull back into a program and can't do anything but simple queries. For example, no way to do merged queries. Which tries to connect to the mysql database on host sql using database called parrt. Note that you can have duplicates but it's not a good idea here. See http://www.mysql.com/doc/en/String_syntax.html but more importantly http://www.mysql.com/doc/en/String_types.html for type info. You can use TEXT type for large strings. 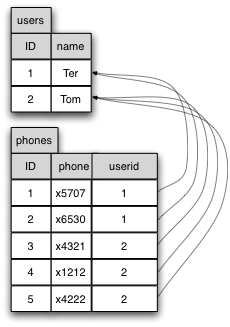 VARCHAR is good for up to 255 in MySQL. Note that this stuff is always database-dependent! CHAR pads with spaces. TEXT is case insensitive in MySQL. Used to store "nothing" in a column. For example, if someone has no phone number, the column value for that row should be NULL. Storing a row of data per key is easy. How do you handle multiple values though for each row? For example, multiple phone numbers per person or all the FAQ entries associated with a FAQ descriptor? Have to use another table and a foreign key. Each phones table entry points back to the user that "owns" this record. Notice that the user does not point at the phones it has; rather, the phones point back at their "owners". Ooops! Gives outer product, but want inner product. Here's another variation where a Person has multiple roles and vacation days. As a 3rd example, consider building tables to manage FAQ entries. You want to define the FAQs (Dogs, Cats, ...) and then have entries within those FAQs. Add more data then do a full join. Every row of FAQ is paired up with every row of ENTRY so there are n*m rows in the join for |FAQ|=n and |ENTRY|=m. much faster as it can grab the data from the index. If two single-column indices, finds row(s) and fetches data. Can use portion of column to reduce mem usage w/o much loss of speed. If you cast one of the JDBC objects to a specific mysql object, it will tell you the id used to do the insert. How can I insert images into a Mysql database? Transaction: do operation then commit concept. Very useful for multi-stage operations to ensure consistent data in database. For example, update customer account and delete from inventory in one operation: must be atomic like with threads updating Java memory. If any part of a transaction fails, then you can rollback changes. If all is well, you can commit. Transactions in MySQL start with BEGIN; and end with COMMIT or ROLLBACK. If you LOCK a table, MySQL allows one write at a time (atomically). All reads wait until all updates are done then reads. Mysql doc: "Without LOCK TABLES, there is a chance that another thread might insert a new row in the trans table between execution of the SELECT and UPDATE statements." An additional problem. With some applications you need to support extended locking. For example, to update a person's user record, you must read then wait a long time for them to hit submit and then must update the database. You do not want someone reading the same record and updating it in between. This is the classic race condition associated with "test and set" operations. You would need to lock tables to ensure proper atomic update and do application locks so duplication operations don't start up. To unlock just set the lock id to NULL. Your application must manage the lock ids and associate a lock id with a user in their session data. They must be able to perform multiple operations. Load a JDBC driver for desired data source. A data source is any database you have access to through a JDBC driver. In the case of ODBC, the data source must be registered with the ODBC driver manager from the Control Panel. With any other driver you setup the access via vendor-specific procedures. Connect to a data source. Once your driver is loaded, you can connect to the specific data source through a URL of the form jdbc:subprotocol:name. Execute SQL statements. You use SQL commands from Java to get results and then use Java to display or manipulate that data. Close the connection. When you are done, you close the connection to the database, freeing the resources. Normally used for efficiency, but MySQL doesn't pre-compile. Nonetheless there are some useful features. can use like a template, don't have to build string and also used to store big values like images. Don't have to escape special char. Fast way to talk to the database since connection is very expensive. Each attribute maps to separate table mapping EID<->attribute(s). Index for every column of entity tables. Dual column index for each multi-valued attribute table. Single thing to change, portability, simplicity, replace with proxy/stub, logging, does the OO <-> DB mapping. Save answer to each query for a while? Cache whole database in memory and then reload occasionally? Don't recompute pages that don't change much. Need to refresh intelligently, however.